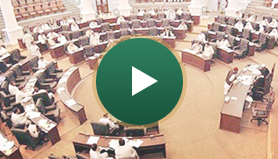 The Khyber Pakhtunkhwa Provincial Assembly has 124 elected members, 99 regular seats, 22 seats reserved for women and 3 seats for Non-Muslims. The Chief Minister of Khyber Pakhtunkhwa elected by the Chief Minister of the Province who forms a Cabinet of Ministers to oversee various Departments. The Chief Minister is also the Chief Executive of the Province. The Federal Government appoints a Governor as head of the Provincial Government. Khyber Pakhtunkhwa is divided into 24 districts. Each district has a Zilla Nazim assisted by a District Coordination Officer. In a District the functions are devolved further to the Tehsil, Town and Union Council Governments. Each District has an elected Zilla Council, elected Tehsil, Town and Union Councils who looks after various activities at their respective levels. At district level a District Police Officer looks after matters of Law and Order and he/she reports to the Zilla Nazim. Each district has a Public Safety Commission which addresses public complaints against the Police. There is a Provincial Police Officer who is in charge of the Police system at the provincial level. In 1901 NWFP(Khyber Pakhtunkhwa) was declared as a Chief Commissioner Province and thirty-one years later in 1932 its status was raised to the Governor Province. In 1937, the Government of India Act 1935 was enforced in NWFP(Khyber Pakhtunkhwa) and NWFP (Khyber Pakhtunkhwa) Legislative Assembly was formed. The first session of parliament was summoned on 12 March 1946 under the Chairmanship of Sardar Bahadur Khan while Nawabzada Allah Nawaz Khan was elected as Speaker and Lala Girdheri Lal as Deputy Speaker on 13 March 1946. The total number of members was 50. This Assembly was dissolved in 1951 and the number of members was increased from 50 to 58. After the creation of Pakistan, the first Election in NWFP Legislative Council was held on 15 December 1951 and the session of the Assembly was summoned on 10 January 1952 for the oath taking ceremony. Nawabzada Allah Nawaz Khan was again elected as the unopposed Speaker and Khan Muhammad Farid Khan as Deputy Speaker on 10 July 1952. Following the declaration of one unit on 3 October 1955, the Country was divided into two provinces, West Pakistan and East Pakistan and the Legislative Assembly Building was declared as Peshawar High Court. After the dissolution of West Pakistan dissolution in 1970, the NWFP (Khyber Pakhtunkhwa) Provincial Assembly was restored. The legislative Assembly became a Provincial Assembly through a presidential order known as legal framework order 1970. After the restoration of the Provincial Assembly in 1970, General Elections were held for the NWFP (Khyber Pakhtunkhwa) Provincial Assembly on 17 December 1970. At that time the number of member’s seats in the Assembly was 43 out of which 2 seats were reserved for women and only one for minorities. The first session of the Assembly was summoned on 2 May 1972 in the hall of Pakistan Academy for Rural Development, University Town Peshawar. Mr. Muhammad Aslam Khan Khattak was elected as Speaker and Arbab Saifur Rehman Khan as Deputy Speaker on 2 May 1972. On 5 July 1977 Martial Law was declared and the Provincial Assembly was dissolved. The 1985 elections were held on not-party basis on 28 February 1985. The first session of the Assembly was summoned on 12 March 1985 for the oath taking ceremony. Raja Amanullah Khan and Mr. Ahmad Hassan were elected as Speaker and Deputy Speaker on 14 March 1985. The Assembly Secretariat shifted from Pakistan Academy for Rural Development to its own present building in 1987. The table below gives a history of NWFP (Khyber Pakhtunkhwa)Provincial Assemblies and the respective ruling party at the time. In 2002, the Chief Executive of Pakistan Issued a Legal Framework Order 2002. The numbers of Members of the Provincial Assembly was increased to 124, out of which 99 were general seats, 22 were women’s seats and 3 reserved for minorities. The election was held on 10 October 2002. Mr. Bakht Jehan Khan was elected as Speaker and Mr. Ikramullah Shahid as Deputy Speaker on 27 November 2002 (though he later resigned). Shahzada Muhammad Gustasip Khan was appointed as Leader of the Opposition on 22 September 2003. 2013 Elections, Emerging Pakistan Tehreek-e-Insaaf as the Largest Party in the Province.